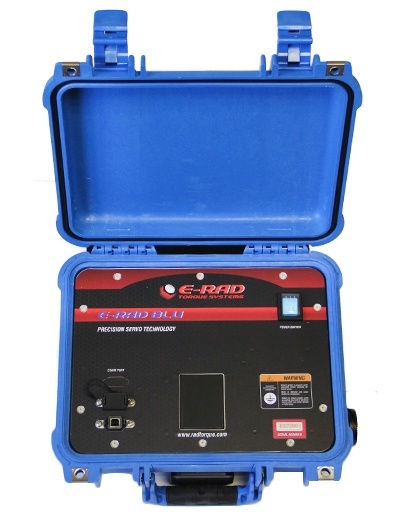 The E-RAD Blu Series Touch Controllers are the interface for all E-RAD Blu Tools. This system allows the user to dial up and down, using the touch screen, in single digit increments to their desired torque. The E-RAD Blu series is bluetooth compatible which can be used in conjunction with a RAD Smart Socket for field and transducer verification. In this video, Maxpro owner Tom Macey takes viewers through each step, from unboxing to working the E-RAD Blu control box. He also touches on safety features, such as the importance of using the snap ring to hold the reaction arm in place. These tools are designed to give users a high degree of accuracy through the E-RAD Blue control box and the precision of an electric AC Servo motor. “I simply touch the screen and enter whatever torque I’d like to enter,” Macey says in the video. For more details, watch the video clip below. And please contact Maxpro if you have any questions about the other torque tools we have for sale and rental.